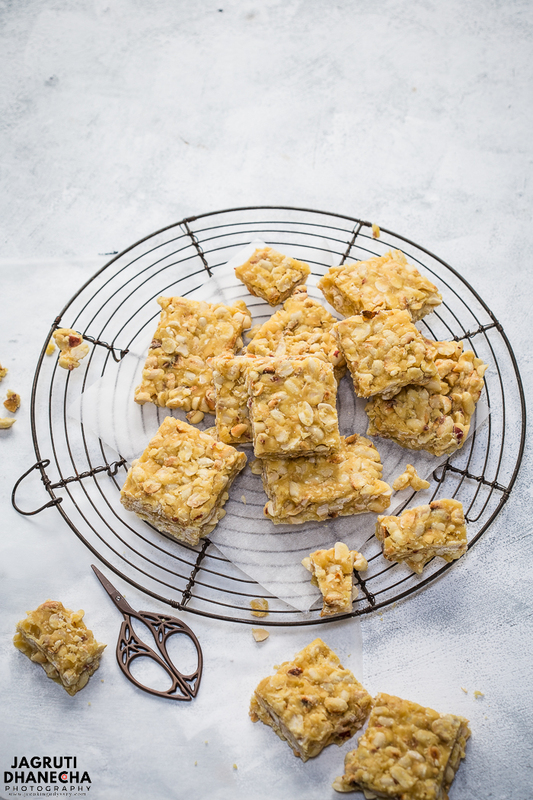 ﻿This wonderful Singdana Chikki/Peanut Brittle or Peanut and Jaggery Fudge, surprisingly so easy to make and wows everyone. A classic Indian style sweet made with only 3 simple ingredients such as peanuts, jaggery and ghee. This freshly made Singdana Chikki taste so well and an ideal gift to friends and family. If you are looking for an easy winter warmer treat that you can make on the cheap, Singdana Chikki it is! The UK is covered in a white blanket and Britain is frozen. Brits are struggling in every corner, the whole country comes to a standstill and people started panic buying. Same time snow is causing distribution problems, officially Britain can't cope with anything like this, mostly everyone is moaning except school children! So many schools are closed and kids are having so much fun at home including my kids too. When kids are at home, means mums are tied to most of the kitchen, however, I love cooking and don't mind slaving ( at least I can stay warm ) in the kitchen for my babies. OK friends, I think I'll stop here and let's see what I made while I stayed warm (kitchen) We have these Singdana/Peanut Brittle! Chikki means brittle and available in India throughout the year mainly in bus and railway stations as a convenient snack on the go. It can be prepared with ingredients like peanuts, almonds, cashews, sesame or mixed nuts, sometimes also find varieties featuring puffed rice ( mamara) and coconut. 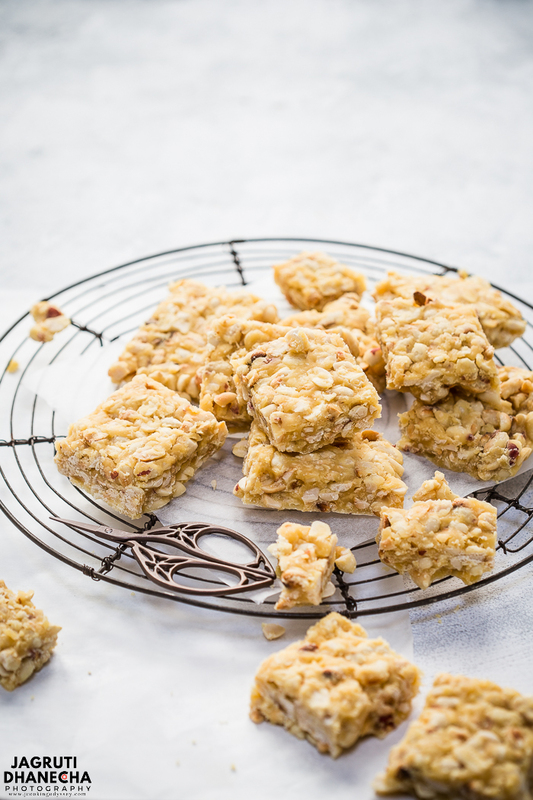 Chikki recipes can be prepared with sugar or jaggery. Mostly relished during colder months. Singdana means peanuts and chikki means brittle. A universally popular snack from the western part (Gujarat) of India, but made in a similar manner all over the country which is healthy for growing up kids, and keeps you warm in winter months Singdana chikki is a delicious traditional snack or dessert that is made with peanuts, jaggery and ghee. Don't get alarmed because you read ghee in the ingredients, it's just a teaspoon of it in there. According to experts and our ancestors, this delicacy is packed with immense health benefits and nutrition, if eaten in moderation. The combination of vital vitamins, minerals and proteins of peanuts and zinc, iron of jaggery. Although chikki can be enjoyed throughout the year in Indian households, it's ancient wisdom passed through generations have woven and often adviced by the elders to consume chikki during winter months. In winter, bodies require food that generates natural heat in the body and keeps the metabolism high, thus ingredients such as peanuts and jaggery are given more importance. Therefor, these delicacies are prepared and enjoyed by all on the winter festival like Makarsankranti, Uttrayan and Lohri especially in North and Western states of India. Usually classic western style peanut brittle is crunchy, sticky and thinner. The recipe is prepared with sugar, also salt is added to the recipe so these are sweet and salty in flavours. Usually, it is served with tea or coffee but it goes perfectly with ice cream too. Where Indian style peanut brittle has a more of a fudge sort of texture, it's little softer when you break it and surely does not stick to your teeth, this recipe does not call for salt. Indian style brittle is consumed as a snack. Peanuts are integral ingredients of Indian cooking, and easily available everywhere. For this recipe you will need unsalted peanuts, either with red or pink skin will do a great job. If you are lucky enough you will be able to buy roasted and skinned peanuts in an Indian bazaar if can't no problem at all, just a little bit more work and time you'll need for this recipe. Jaggery is a must for traditional singdana chikki, if you can't find jaggery maybe brown or muscovado sugar come close to it. Your chikki colour depends on what type or what colour of jaggery you have used. darker the jaggery, darker the chikki. Ghee you won't require lots, just a teaspoon to a tablespoon. Instead of Ghee, unsalted butter would work too. For a vegan version, omit the ghee totally or use coconut oil or unsalted peanut butter. Roast the raw peanuts on low heat. Once little cooled, remove the skin. Heat ghee and jaggery until it completely dissolves. Transfer into the greased tray or thali and spread it evenly into 1cm or 1/2" thickness. Let it cool for 10-12 minutes then cut into the desired shape. 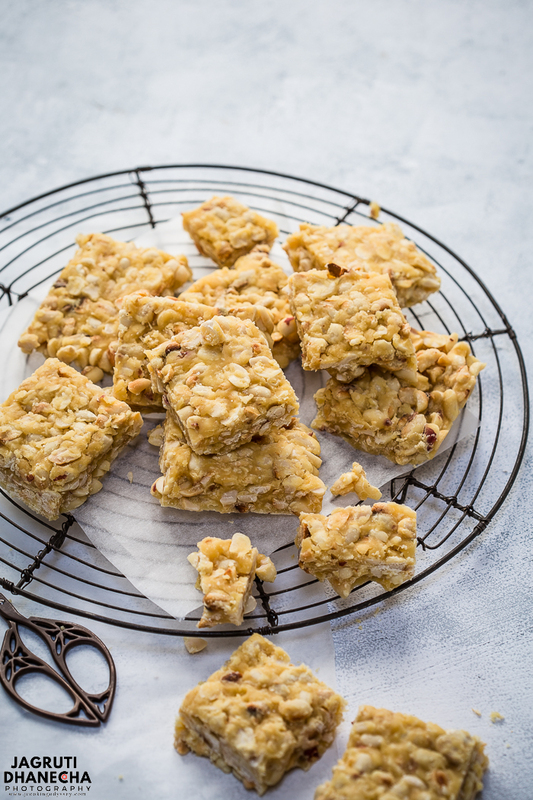 This wonderful Singdana Chikki/Peanut Brittle or Peanut and Jaggery Fudge, surprisingly so easy to make and wows everyone. This classic Indian style sweet made with only 3 simple ingredients such as peanuts, jaggery and ghee. Grease a tray or thali with flavourless oil or ghee, leave it aside. Roast peanuts in a heavy bottom kadai or non-stick pan and roast till you see peanuts skin starts coming off slightly and smell toasting aroma OR roast it in the oven for 5-7 minutes on 350F. Let the peanuts cool slightly, then remove its skin by rubbing it on your two palms. Place the pan over the medium heat and add ghee and jaggery. Allow the jaggery to melt, keep stirring continuously. The mixture will go slightly darker in colour, once the mixture starts bubbling add crushed peanuts and quickly mix well. Immediately transfer the mixture onto the greased tray and level it with a spatula. Allow to cool and cut into desired pieces or just break into bite-size pieces. Once they are cool completely, store in the airtight container. These chikkis can stay fresh for up to a week. Note:- This post was originally posted in December 2010 but I have updated the post since with newer photos and content. Love these chikkis.. peanuts ate my fav..my mom makes it.. but i havent tried till now.. its freezing here too.. the whole country has come to a standstill and i am in a sort of house arrest! I want some brittles rite now, am just drooling here..
looks too good!...nice stuff for the kids to munch when at home Jagruti! Lovely peanut brittle I make with sugar instead.We too have lots of snow although my daughter managed to get to school. lovely chikkis jagruti, i am sure ur kids must have enjoyed them!! I love peanut brittle and once I get started I can't stop eating it. Lots of snow here in Minnesota too. Mmmhhh, that's for me! I am addicted to peanuts and brittle. a nice snack..i am afraid I will finish off the whole plate given a chance! looks crispy, like step by step pics. I made this chikki 3 days back and it vanished the same day . Today i have roasted some more peanuts n will be making it in a few minutes. this is a favorite , soft or hard n brittle anyways .. Irresistible brittles looks very tempting. Lovely presentation for this crisp and delicious chikkis, Jagruti. Would love to have a few slices any time of the day. I am so happy to find your blog and especially this recipe. this is my mum's favorite. I am going to make this and pack it nicely and put into her Christmas socks this year. thank you so much! you know my mom loves this and now with a big thank you I will make this at home for her. awesom e.
Chikkis look so tempting and crunchy. Loved the peanuts included in it. ur peanut brittles look sooo yummy. i hav always been a fan of it and now am craving for one... thanks for sharing this.. I am waiting for the snow here :).These brittles look so tempting and they have come out perfectly.Take care..
With only 3 ingredients, this is a winner and such a delicious treat, thanks for sharing dear..
What lucky children! We have lots of snow here and it is a good day to stay inside and cook this yummy looking recipe! I love peanut chikki but never tried at home. Your looks perfectly crisp and yummy. Loved it. I'm craving a little sweet treat and this looks so delicious. We never really had sweet peanut things growing up - unless you count peanut butter and jelly sandwiches. I can't wait to try this. Chikkis are my favorite in winters and I prefer the peanut one over all of them. You have made them so perfectly and I feel like grabbing a few pieces from the screen. Peanut brittle looks crunchy and delicious.Love the colour of the brittles. I became fan for your beautiful clicks.